Of all the climbing roses that are out there today, it's safe to say that the red roses are by far the most popular. And who can really argue that point? Red roses are classic and elegant and really lend themselves well to just about all landscaping ideas and designs. Red roses are the color of choice on that special day every year where we show our loved ones just how much we care. So it's not really surprising that so many people would want to bring these into their backyards. When I first started growing roses myself, I naturally did what many others did and went looking for traditional red climbing roses first. I was surprised to discover that the choices out there were unfortunately few. The options you do have to choose from however are absolutely stunning. 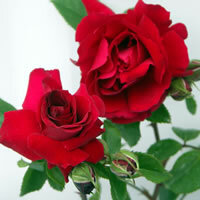 You should have no trouble finding a climbing red rose that you can quickly fall in love with. 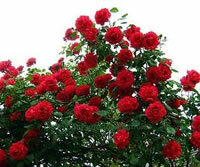 Just about anywhere you look you will usually find the same three varieties of climbing red roses for sale. They are the Don Juan, the Blaze, and the Stairway to Heaven roses. The Blaze climbing red rose seems to be one of the most popular of the red climbers because it produces an absolute explosion of red blooms that continue on for the entire season. This particular rose will grow upwards of about 12 to 14 feet tall and is hardy in zones 5 through 9. If you like your roses to have a rich fragrance to them, well then this isn't the variety for you I'm afraid. The Blaze red rose has a very light, subtle musky scent to it. 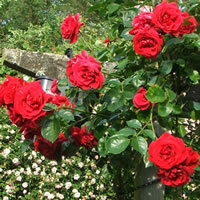 If fragrance is your thing then you really are going to want to take a look at the Don Juan red climbing roses. This variety is one of the only climbing red roses in the world with such a strong fragrance to it. The blooms are a little on the small side, about 3 to 4 inches in diameter, but they have a deep rich red color with soft ruffled petals that have that lush feel of velvet to them. This climber also produces its blooms on nice long stems that are ideal for those who want fresh cut flowers. 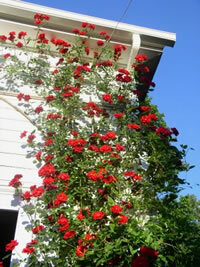 The Don Juan climbing red roses will grow about 10 to 12 feet tall and are hardy in zones 5 through 10. The Stairway to Heaven climbing red roses are not quite as popular as the first two it seems, but they are no less beautiful. They are extremely vigorous climbers and you will find once you plant them they will cover their space quickly. They are also among the first roses to bloom in the spring time and they will just keep on going throughout the growing season. As with the first two you can maintain the Stairway to Heaven roses in zones 5 through 9 without any trouble, but any colder than that and you will need to winterize your plants or risk losing them. The Stairway to Heaven roses grow about 10 to 12 feet tall. 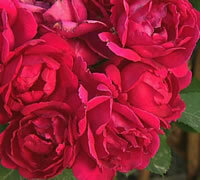 Growing climbing red roses is pretty easy that just about anyone can learn to do it well. For this reason climbing roses are very popular with newer gardeners because they are much more forgiving than other varieties. The most important thing is the location you select to grow them in. It is of the upmost importance that you give them a good 8 hours a day of direct sunlight. Producing all those blooms requires a lot of energy, and you will need to make sure they have adequate light if you want them o perform. Proper watering and well drained soil are also critical requirements to successful roses. If the soil doesn't drain properly and the ground stays too wet, you will run the risk of exposing your roses to diseases and various pests, and that is not fun for anyone. Another important part of growing red climbing roses is using a good compost, or other organic matter when you first plant your roses. This is a mistake I see a lot of growers make with many types of plants. Never assume your soil is just good enough because things grow in it. I always keep a bag or a wheelbarrow of good compost and I mix that into the hole I am planting into. This is one simple tip that goes a very long way! As you look around, you might find other red climbing roses that interest you, such as the French Red Eden rose that is not unlike the pink version although with gorgeous deep red blooms. There is the Dublin Bay climbing red rose that is highly resistant to diseases, has a somewhat subtle fragrance and grows up to about 12 feet tall. The Altissimo red rose is a shorter variety of climbing rose but this gem will produce giant blooms up to 5 inches in diameter. This is truly an eye catcher when in full bloom! Red climbing roses are some of the most truly stunning roses one could ever plant in their gardens. Lots of people love roses but there are few other colors that just inspire the same amount of awe as the deep red roses. Many of the red climbers have exceptional fragrances too so take advantage of this trait by planting them close to walkways and porches, and even a window that you might frequently open up to let fresh air into your house. Nothing beats the alluring fragrance of a rose as it travels across your garden, and throughout your home. Your friends and neighbors will be green with envy at your wonderful display of sensational red roses.